ABM’s™ proprietary Bradyrhizobia for soybeans is specific to these crops in helping the plant to establish nitrogen fixing nodules that will convert atmospheric nitrogen to nitrogen that is useable by the plant. Encapsulated in a dealer applied package, Excalibre™ is a fast and convenient application. 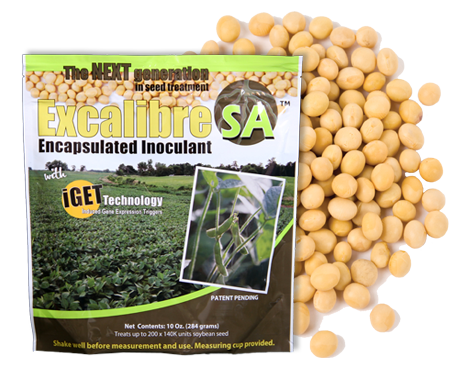 The “SA” in Excalibre-SA™ for Soybeans means that ABM™ has also added our proprietary, patent pending Trichoderma strain found in SabrEx™ root inoculant; proven to also be beneficial in soybean production. Trichoderma colonizes with the plants root system and develops a symbiotic relationship with the plant. The Trichoderma feed from the starches and sugars produced by the plant; while exuding beneficial enzymes and proteins for the host plants use. As a result the plant produces a larger root system and improves its nitrogen and water use efficiency, thus resulting in higher yields.